At its most basic level, a library is a curated collection of books and other materials. Of course this does not fit when we add the word “public” to “library.” This is where things need a bit more explanation. I think that rather neatly sums it up, although I hate the term “paraprofessionals” as it sort of implies that library workers are only acting sort-of-alongside professionalism. It’s rare for me to meet an unprofessional library worker. Journalists take note – if you want to talk about libraries, talk about library workers. Many people still don’t grasp that their local authority has a statutory obligation to provide a “comprehensive and efficient” public library service. To fail to do so is to fail in compliance with the regulations. Frankly it is also robbing you! You have paid for these libraries in your council tax – it is literally your right to have that library. It’s not a nice extra, it is a statutory requirement. I find that many articles about public libraries fail to mention or understand the key elements that make public libraries great, and so here is an article to help anyone writing about them, and a few suggestions of what NOT to say. Wrong. In fact evidence supported by the Government shows that libraries actually return roughly five times whatever is invested in them. ACE carried out some research that showed the public library service even saves the NHS money. A lot of money. In fact roughly 27.5 million pounds a year. A public library does things that nothing else in a community does the same way, from parent groups to adult mental health support. It does this in an informal and casual setting that most people find more welcoming than formalised support groups. No need for appointments or awkward and uncomfortable meetings with “officials”, just drop in. This means that countless vulnerable people are able to cope and carry on living alone because they know that they have somewhere they feel safe and can turn to. That phrase “feel safe” is very important. Public opinion states that library users generally trust library workers, and that trust should never be undervalued. It takes a decade to build loyalty and trust in any organisation, and five uncomfortable minutes to lose it forever. Library users often talk of feeling safe in libraries, that is absolutely essential to protect. Lack of investment and diminishing professional staffing reduces the feeling of safety. Councils have no money, so it’s either libraries or children’s services. Wrong, but let me explain why. There is no doubt that decades of mismanagement and poor spending decisions have left local authorities with debt and significant funding gaps. Swingeing austerity cuts have also left deep wounds in many aspects of local govt services, but this has meant that local authorities are using emotional blackmail to excuse closing libraries. People need to understand that cutting libraries IS cutting children’s services. It is also cutting mental health services, services to the elderly, services to the vulnerable, the unemployed, the lonely, the disenfranchised, and refugees. The only place in our communities that can (and should) serve all of these people, all people, without bias or judgement is the local library. When you cut libraries, you cut services to the most vulnerable people in society. What really makes a library great? This one is easy. What makes a library great is not the building, or the books, but it is always the library workers. The people who daily make a commitment to support the needs of their users and their whole community. It is essential that these people are paid a fair wage, and that they are well trained and that their role is appreciated and understood. Library workers should all be following a set of clearly defined ethical principles, and they should be paid, insured, and protected by their local authorities. Without library workers, it’s not a library, it’s just a room with books in. Stop focusing only on the “rosy glow”. So many articles only wallow in nostalgia that it allows others to perceive libraries as some kind of bubble that is trapped in the past. This could not be further from the truth. Please don’t write about libraries solely from your memories of childhood. Sure, share those (because they are so charming and we all need a bit of library love from time to time) but please take the time to find out what libraries are doing today, and check out how much they have moved on. If you haven’t regularly used a library since you were a child, you are not the person to be casting around public opinions on how they should be improved. We’ve all read these things, and they are simply not true. 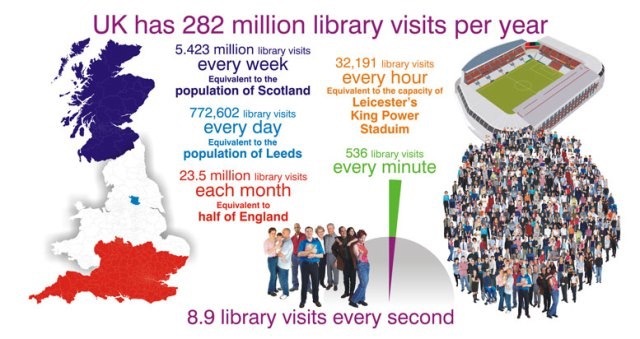 The UK had over 282 MILLION library visits in 2016, and it averages around 250 million a year. That’s enough to fill the London O2 Arena over 14,000 times. That’s a pretty big number. Just think about that for a moment. That’s the same as filling the O2 every night for roughly the next thirty eight years, and public libraries are doing that every year. Okay, so we know that all of these “no ones” are using public libraries, and that also shows that it’s a myth that “no one” needs them. It’s not “all on the internet” and that’s just an ignorant and privileged thing to say. The digital divide in the UK means that around 10% of people have no internet access and are not regular computer users. Another big number here because at current population figures that means that around 6.5 MILLION people have no computer access or skills. That’s roughly the same figure as twice the population of Wales. So even if it was “all on the internet”, many people would not be able to access it. Let’s take a look at one thing that is on the internet, but perhaps shouldn’t be – government paperwork. It is a sad fact that only 54% of applicants were able to fill out the Universal Credit forms without extra help. When people struggle with this paperwork they are usually sent to the library to do it. In fact official advice is to “go to your public library” to seek help filling out the forms. Of course, this is only possible if the library has staff and that it is actually open. “Old fashioned”? Well, this is usually only said by people who have not visited a library since they were five. Libraries and library workers have been running ahead of rapid technological advances far better than most organisations. We were offering computer training when others were still trying to work out what a mouse was. We’re not playing at this stuff – information is our business and that means in all formats. On the surface things might have appear to have remained unchanged, but underneath that swan is not only paddling fast, but on feet that you’d barely recognise. The main problem with library workers is that they make this stuff look elegantly easy – and it really isn’t. Libraries are too quiet for the modern world. Oh my word, ask any library worker what drives them mad and they’ll tell you that every time they tell someone what they do for a living, people say “I bet you say ssshh a lot”. Frankly I only say “ssshh” to people who say that to me. Libraries are quiet when they need to be, and that’s very important. The last place in our towns where you might be able to find some peace and respite from the chaos of the 21st century. A library is such an important study space and is often the only place you can quietly gather your thoughts. That said, most of our libraries are also buzzy and noisy and full of activity. I can see one from my window and there has been a steady stream of people all day. When I worked there we were rushed off our feet almost all the time, and the quiet of the evenings was essential for those who needed to study. Noisy is good, and quiet is good too. Now take a look at how hard library workers strive to offer both things to their users. A suffocating silence is, however, falling in public libraries but this is for quite another reason – gagging. Many library workers at all levels are now gagged by their local authorities and unable to talk about what is really going on in their areas. Go and talk to library workers, and ask them. Ask them if they are gagged and give them the opportunity to talk with anonymity. It is well worth doing this with volunteer workers too. They are being expected to post a rosy picture, but all is often not what it seems. This one really grates on me because no one says it about any other statutory service or Govt provision. No one ever says that a group of volunteers with a med-kit is better than a real doctor, or that a bunch of well-meaning locals with a hose will do instead of the fire brigade. If your library does not do all of the things I’ve mentioned above (and more), and does not have paid library workers, then to my mind it’s not fulfilling the statutory requirements. Handing a library over to a small charity or group who have no sustainable plan, and no plans to take on paid and experienced staff, is not saving it but rather staving off the closure. It is a band-aid on an open wound and it will not stop the haemorrhage. I have been looking at volunteer library business plans for almost a decade now, and I have yet to find even one that would not be laughed at by a real bank manager. Good people are being lied to, and are being expected to carry the burden of delivering a statutory provision without any clear framework, or a long-term sustainable plan. They are being fobbed off, and when their library does close it is the groups who will carry the blame. There is also the element that this sort of library is entirely dependent on the community. Where the community is unable to support this process, they will not have a library. This is also being pedalled as their fault, and that is morally and ethically wrong. In fact, I feel that expecting people to work all the time for free is also morally and ethically wrong. Many local authorities state that their volunteer led libraries are a “success”. I would ask all journalists to ask for proof of this. Falling issues and visitor numbers, unstaffed access, reduced services and diminished open hours have all recently been passed off as “successful”. Few authorities have actually bothered to perform solid analysis of their volunteer libraries, possibly because those who have see a rather bleak picture. If you are a journalist visiting a volunteer led library, check a few things, and ask a few questions. Does it still form part of the statutory requirement? Ask to see their comparative issue figures. Ask if anyone in the building adheres to a set of clear ethical principles? Ask if they have all been trained in things like privacy and the new GDPRs, and if they know what they are doing in terms of data capture and handling. Ask if they have a sustainable plan for future funding. One last thing – words are important. They are, after all, our business and so we want to protect definitions because they matter. A shelf at the train station full of discarded books is not a library…..
You get the idea. When you use the word “library” please be sure that you are actually talking about a REAL public library (a staffed and funded public library that forms part of the local authority’s statutory library provision) and not a community book-swap point. Remember, a public library is a library that is accessible by the general public and is generally funded from public sources, such as taxes. It is operated by librarians and library workers, who are also civil servants and it forms part of the statutory public library provision for the local authority as per the regulations relating to the Public Libraries and Museums Act 1964. You’ve paid for these places, time to assert your right to them and to talk about them in clear and unapologetic terms. Oh, and you don’t have to be a library user to understand and appreciate that a great library improves your community and has societal value. In the same way you don’t have to have a house in flames to appreciate a well funded fire service. Some things simply make the places we live better, safer, and more bonded as communities. I don’t have a small child who likes slides, and it’s been a very long time since I tried to get over the bar on the swings, but I know that parks and green spaces make for a better place to live. Libraries do that too. I get that, and I hope we all do. I’d like to now invite library workers to describe in the comments all the things that you do that are NOT stamping or shelving books. I couldn’t possibly list in this article all of the things that you do, so I shall leave it up to you. Journalists – here are some facts and research that you will find useful. Thank you for supporting our public libraries, and please keep doing so. If you ever need any quotes or other details, or if you want to contact someone to talk about libraries in any of our many sectors, please drop CILIP a line, or seek out some of the wonderful library campaigners who give their lives over to protecting our public libraries. One last thing you might need – take a look at the extraordinary work done by library workers to change and save lives. These are not all from public libraries, but it gives you a taste of what library workers mean to the world. Dawn Finch is a CILIP Trustee and chair of CILIP’s Ethics Committee. She is a librarian and children’s author. I am a library campaigner. I have that in my profile descriptions on social media, and I am known for this role. I campaign and write about libraries, and am a familiar face at rallies and events connected to libraries and reading. I was President of the Chartered Institute of Library and Information Professionals (CILIP), and now I am standing for election as a CILIP Trustee and so it is evident that I care a great deal about our libraries. Recently someone asked me that crucial question – why bother? It seems like a lot of work, and you don’t get paid for it, so why bother? After I had calmed down, I explained that the answer was so huge that I couldn’t do it justice in a few sentences, and so I thought I would share some of my past writings to explain why it matters, and why I bother. Why do I need libraries in the first place? Well, I want a society where people have intelligence and are informed and creative. That matters to me and that’s what libraries (and in particular school libraries) do. I wrote about that here…. I want our children to grow up as readers and to have the skills to access education with greater ease. I want them to be prepared for life and for the onslaught of fake news and biased reporting. I want children to have empathy for others and greater understanding of the world around them. I want them to have a school librarian. I wrote about that here…. I want people to read more. Reading for pleasure makes people happier, more rounded as human beings, and they even earn more. I sit on the Reading Agency’s national steering group looking at the wider impact of reading for pleasure, and the evidence is clear – people who read more benefit hugely. Books are expensive. For everyone to read more, and for society to benefit from it, we need more libraries. I wrote about that here…. But here is the big one – I passionately believe that it is vital to protect library workers. We have just had Libraries Week, and I must confess that I was dismayed to discover that many people were sharing things as if the library was some kind of sentient building that was doing all of these amazing things without any human involvement. Masses of people all talking about how astonishing libraries are… but I could count on one hand the number of high-profile media pieces that actually mentioned the library workers who make all these things happen. This is why I bother, and this is why I can’t stop campaigning for libraries – because the societal value is huge. Libraries save society money, and improve quality of life and opportunities for millions of people. It is sheer idiocy to put them in danger. To even suggest that libraries offer anything less than extraordinary value for money is a lie. Simple as that. A lie. I don’t mind shouting that from the rooftops. Look at the stats if you don’t believe me. Nobody uses libraries? Who are all these nobodies then? I am standing for election as a CILIP trustee because I’ve always believed that if you are going to say a thing you should say it where people are best placed to hear it. If I don’t like a thing, then I’m prepared to step up and try to get something done about it. I can grumble and moan and shout all I like in the vacuum of social media, but it is in the corridors of power that the silence falls and the selectively deaf walk. Representing an organisation like CILIP allows us as a collective to speak louder and to shake the ivory towers. I do believe that there is strength in the collective. I’m up against some stiff competition in this election, and all of the people standing share my thoughts. Libraries will win no matter who is elected, but I can’t not stand. Making a stand is kind of my thing. I’m in excellent company. If you are a CILIP member I strongly advise you to take part in this democratic process. It’s your vote, your voice, use it! If you’re not a CILIP member, join us! Everyone with an interest in the library and information profession is welcome. All in all, I want to look back on my life and know that I did everything I possibly could to make a difference. This is why I bother, because it matters. Dawn Finch, librarian and children’s author, was president of CILIP in 2016 and is the current chair of CILIP’s Ethics Committee. She is a member of a number of national committees concerned with literacy and libraries, and a member of the Society of Authors’ Children’s Writers and Illustrators committee focusing on children’s reading for pleasure, and the rights of authors.